Outdoor Classroom Space Takes Shape!! For the past 2 months, the Filbert St. Garden has been working closely with teachers and students at Curtis Bay Elementary/Middle, as well as with volunteers from the community and from as far away as Cleveland, to finish the first phase of our Community Outdoor Education Space. Grants from the Captain Planet Foundation, Whole Kids, and Child First Authority have made so much of this progress possible. 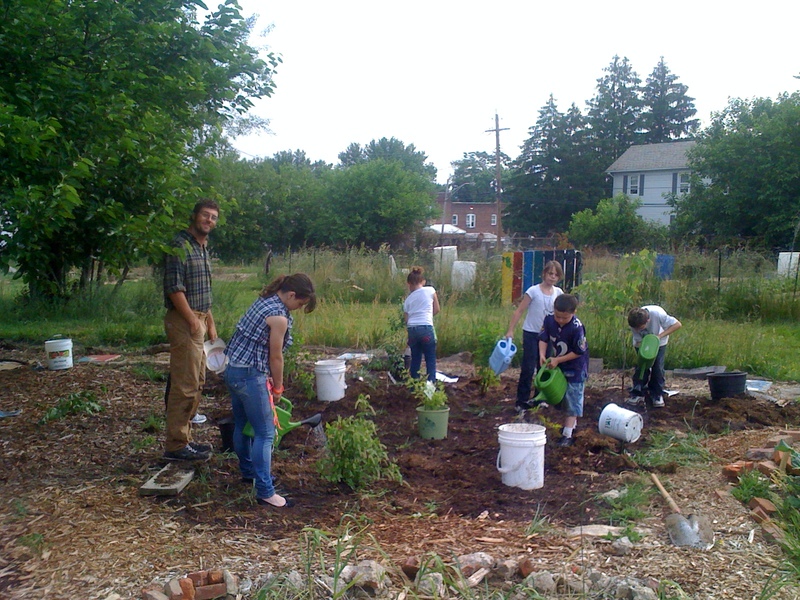 A huge aspect of the outdoor education space is the planting of a Native Plant Garden. Designed as an integral part of the outdoor classroom, growing areas, and community circle, the plan for our native garden calls for over 250 individual plants, spanning close to 40 species! Students from CBEMS have spent the last few weeks learning about the importance of native plants. They have learned techniques that landscape architects use when designing and planting. Some students have even come away with a fantastic amount of knowledge about the plants they are working with. Students worked hard to remove invasives from the planting area. They selected their plants from species of Milkweed, Native Grasses, Coral Bells, Jack-In-The-Pulpit, Red Bud, Winterberry, Sweetspire, Pepper Bush, Choke, Elder and Service berry, Coneflower (Echinacea), Goldenrod, Hyssop, Aster, Bee Balm, Sensitive Fern, Foxglove, and Foamflower. and watered their new garden. While doing such a large planting certainly had it's challenges, one of the huge rewards came at the day's end, when students and volunteers alike could look out over their community's water tower and see over 1,000 square feet of beautiful gardens, native plants, nature trails and classroom. So far this project has involved 7 teachers, over 50 students, and numerous volunteers, in a sustained effort to build one of the most effective outdoor classrooms in Baltimore City! The opportunity for us to recognize the individual's power to inspire real and true change is not something that will fade with the onset of summer vacation, or that will be lost in the years to come. Thanks to everyone for all your hard work!